A prior Russia-drafted UN MH17 resolution already calls for an independent international investigation – yet it is Ukraine and the US which are withholding possibly useful data. So who’s actually an obstacle to clearing up the issue? Russia bashing season is at its peak in Western press today after Russia vetoed a UN Security Council resolution calling for an international tribunal to prosecute those responsible for the shooting down of MH17 over Ukraine last year. Russia’s veto is being presented as a shameful confession of guilt. However, as usual the Western press uses half-truths, hypocrisy and double standards in its spinning of the facts. 11. Demands that those responsible for this incident be held to account and that all States cooperate fully with efforts to establish accountability. However more than a year after the tragedy the investigation has been far from “thorough” and not in full “accordance with international aviation guidelines”. In an unprecedented move, Kiev has to this day refused to hand over the recording of Dnepropetrovsk tower communications, that would show the full picture of what was going on in the skies above Donbass. Furthermore, since the start of the Donbass conflict in March of 2014, US has had satellites over the region, but has to this day released only Twitter-based evidence as proof of Russia’s involvement. 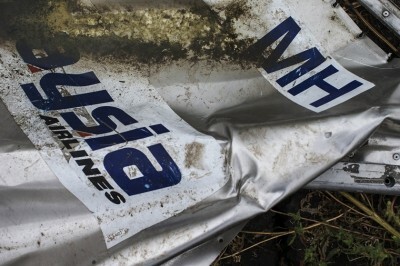 Minutes after the crash, while the wreckage was still smoldering, the Western press knew for a fact who was responsible – Russia. No one cared about the fact that a few days before the tragedy Ukrainian TV showed Ukrainian BUKs in the area (now Ukraine says it sold all its BUKs years earlier, despite ample video evidence to the contrary), or that Kiev routed planes over east Ukraine despite obvious dangers of civil war on the ground – “Putin killed my child” plain and simple. So this proposed tribunal was just another PR-stunt by the West to put Russia into a corner that would reinforce the “evilness” of Putin’s regime, but would in absolutely no way affect the investigation. But who needs facts and proof when blame has already been assigned minutes after the tragedy? Twisting and ignoring facts is only part of Western media hypocrisy, however. If Russia’s veto is proof of Russia’s involvement, then, by that logic, Canada’s, Ukraine’s and the US’s “no” vote on last year’s UN resolution “Combating glorification of Nazism, neo-Nazism and other practices that contribute to fuelling contemporary forms of racism, racial discrimination, xenophobia and related intolerance ” proves that those three countries are Nazi-racist-xenophobes. By the way, two out of three of the above mentioned countries have themselves shot down civilian aircraft. Take a look around. What is going on in the world and in Europe. We are not the first or the last ones [to shoot down a civilian plane]. No need to make a tragedy out of this mistake. Mistakes happen all the time. Even bigger mistakes than this one. But none of these present or historical facts are important to today’s Western press. They are out on a mission to stoke up tensions and create hatred, and this UN vote was expertly played out just for that: for the picture of Russia vetoing an illegal and unnecessary resolution. “You furnish the pictures and I’ll furnish the war”?